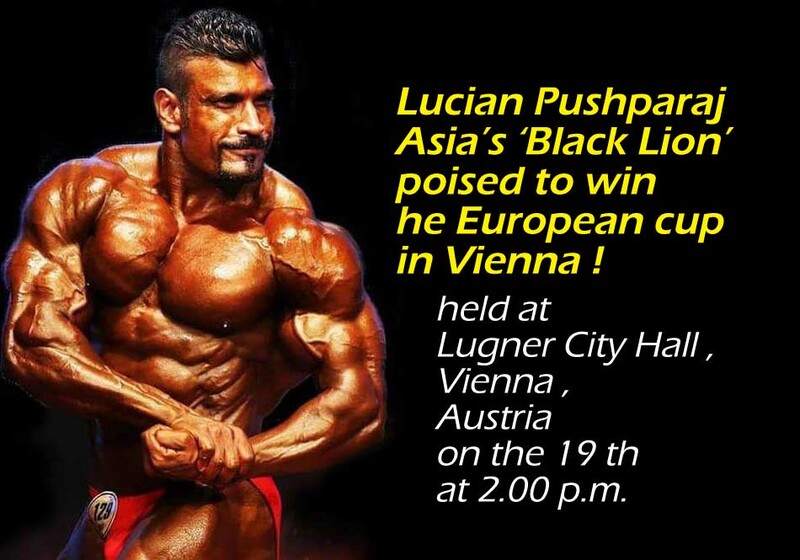 LEN - www.lankaenews.com | Lucian Pushparaj Asia’s ‘Black Lion’ poised to win the European cup in Vienna ! Lucian Pushparaj Asia’s ‘Black Lion’ poised to win the European cup in Vienna ! (Lanka-e-News - 17.May.2018, 11.45PM) Body building champion Lucian Pushparaj popularly called the ‘ Black Lion’ who is currently the All Asian body building championship winner and considered as the best body builder the country produced hitherto , has secured the opportunity which no other SL ‘s Body Builder could so far – that is to participate in the up coming Body Building contest to be held in Europe. Recently , Pushparaj who participated in the ‘Mr. Atlas 2017’ contest held in America by the “World body Building Association “ won the ‘Inspiration Award’ securing the fourth place among contestants from over 40 countries. He is the first SL body builder who won such an international award. For Lucian who is now undergoing most rigorous and difficult training for the last five months after his participation in the American contest, the up coming competition is his first for this year. It is significant to note , the up coming competition is being held in Austria which is the motherland of world famous body builder and actor Arnold Schwarzenegger who was a former governor of California , America. Schwarzenegger rose to international fame as a body builder beginning with Austria . The upcoming world competition is being held for the 9 th time in Europe. Lucian Pushparaj is considered as the only closest rival and the greatest threat to Europe’s present body building champions , Armin Gangle and Stefan Wotawa . In the 51 st Asian body building championship tournament held in 2017 in which 29 Asian countries took part , Lucian won the tournament championship as well as the above 100 kilogram weight category cup . He also secured the 4 th place to win the ‘Inspiration award’ in the Mr. Atlas championship held in Texas , thereby bringing international fame to his motherland. Lucian who is receiving special training from world renowned body building champion Ronnie Coleman who was Mr. Olympia 8 times , and his trainer Big J , as well as their advice and guidance , phoning Lanka e News said , his only aim and ambition is to somehow win the coveted 9 th Austrian championship cup for his country. The Championship contest is scheduled to be held at Lugner City Hall , Vienna , Austria on the 19 th at 2.00 p.m. The organizers and Lucian are inviting the Sri Lankan fans in that country and neighboring countries to attend the event with the Lion flags to encourage and cheer him. This time the sponsorship of Lucian is by the Texas Business Society ,a Sri Lankan business enterprise by the name of Riyococo Lanka (Pvt) Ltd., and Ceyhinz Link International Inc. , Texas , U.S.A. Already Lucian is the Brand ambassador for Riyococo .